1) Wash and rinse spinach well. In a large skillet over medium heat cook the spinach until just wilted. Transfer spinach to large colander, refresh under cold water, and set aside to drain. 2) Return the skillet to the heat and pour in the oil; add the onion and sauté slowly over medium heat until golden. Remove onion from skillet to cool. 3) Squeeze the excess water out of the spinach. Chop the spinach and add it, along with the feta cheese, to the onion, and mix everything to combine well; season with pepper to taste. 4) Preheat oven to 400 degrees. Line one or two baking sheets with parchment paper. 5) Place a sheet of phyllo dough on a work surface and brush it lightly with oil; cut it in half, lengthwise, and fold each piece in half; brush the top of the folded sheets lightly with oil. Arrange about 1 rounded tablespoon of spinach filling at the bottom corner (see illustration). 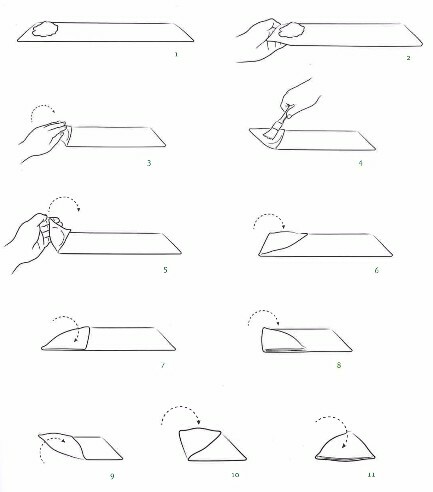 Pick up the corner of the phyllo and fold it over the filling to the opposite side, to form a triangle, brushing lightly with oil as you fold. Continue lifting and folding from one side to the other all the way to the end, as you would a flag, tucking in any leftover bits and ending up with a tidy filled triangle. Brush the top with a bit of olive oil and place the triangle on the baking sheet. Repeat with the remaining phyllo and filling.